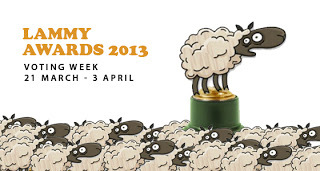 Home » Articles » 2013 Lammy Awards – The Submissions, The Nominations and me. 2013 Lammy Awards – The Submissions, The Nominations and me. I am a proud member of the LAMB (Large Association of Movie Blogs) and have been for just under a year now. I’m still not able to spend any social time on The Lamb, but what I do go there for is the large range of high quality film blogs available. Like everyone, I have very little internet time and so my film blog visits tend to be academic or investigative. It’s from The Lamb blogs that I have learnt more about films that I wasn’t previously aware of than from any other source. So many film blogs, so little time. There are over 1,000 active film blogs in the Lamb community, and this is growing at a rapid pace. What I like so much about The Lamb is the categorization of blogs so that a unique variety is on display. This isn’t very formal just yet, but with the community growing as fast as it is, the pressure on bloggers there to come up with something unique means posts are regularly an alteration on the universal opinion. This light competition raises the standards of the blogs in the community. Part of what constitutes this categorization is the annual Lammy awards. The Lamb opens its doors for the community to nominate bloggers who have reached a certain level of excellence in predetermined categories. 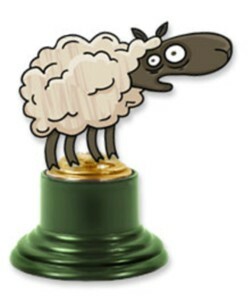 Bloggers can submit themselves for recognition (as I did with the “most knowledgeable” film blog category) or others can submit a blog they admire (as someone else submitted my blog for “best new Lamb”) and then the group there nominate and vote on the final winners. Because of the size of the community, and the high quality levels, it is fast becoming an award with some clout. Some sites, such as my regularly referenced favorite Bonjour Tristesse are submitted many times over and others such as Movies and Songs 365 (another favorite blog of mine) are submitted for the category they have chosen to specialize in. Movies and Songs 365 excels at observation and opinion; Chris is probably the best blog commenter and reader I’ve ever seen, so he is being recognized for his efforts in community building. Chris’ observations are very intelligent and always from fresh perspective. What I get out of the awards. I put myself forward for most knowledgeable blog. I am very new to the community and don’t expect to win a nomination in this award category. The reason I say that is not false modesty (shudder) is because “most knowledgeable” really refers to a kind of encyclopedic knowledge of film, film technique and various filmography. I can’t put myself forward as knowledgeable in any of these categories, so why did I submit myself? What I am able to contribute a great deal of knowledge on is film analysis, philosophy and psychoanalytical interpretation. For me, the point of film reviews, is to continually examine and question our role as viewers of cinema and cinemas role in affecting culture. Blogs that work from this perspective are rare. Although I have little chance of being nominated and even less chance of winning this award, I put myself forward for it in the hope “most knowledgeable” might be extended to this kind of “knowing” in the future. My peers have submitted me for Best new Lamb. I have to thank Bonjour Tristesse for this honor in particular. This one I am eligible for – and never will be again, Ha! – but again, I am up against some wonderful film blogs of a very high quality that might be new “Lambs” but have been going for a long time and really know their stuff. However, just to be submitted for nomination was a big thrill for me. I also have loved discovering some amazing new film blogs. Check out the submissions here. If you have any interest in film blogging, you will be very pleased you checked out the list. So that’s it. Have fun looking through all the links. These are all great blogs, and represent a very high standard in lay film critique.